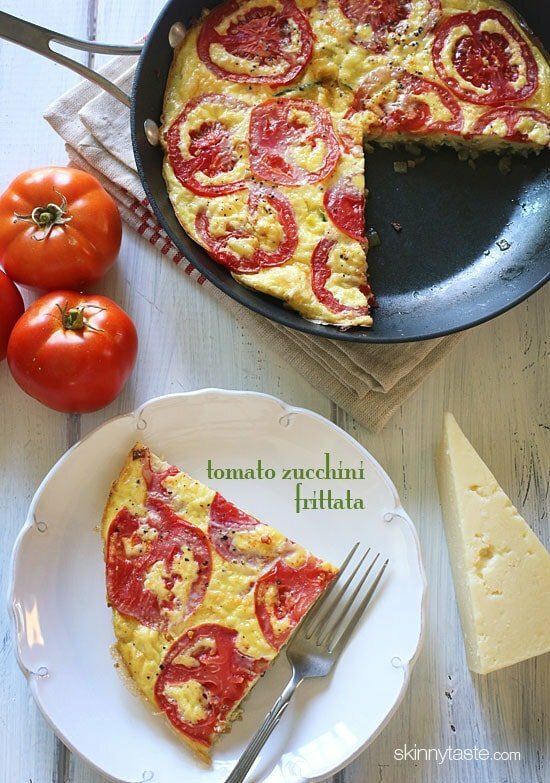 Garden tomatoes, summer zucchini, and Asiago cheese make a scrumptious frittata that highlights the end of summer’s bounty. More easy frittata recipes perfect for brunch that I also love Swiss and Asparagus Frittata, Mushroom Shallot Frittata or Bell Pepper and Potato Frittata. Summer tomatoes are abundant and delicious right now – my garden is overflowing with them! I’ve been enjoying them in salads and quick garden sauces, over grilled flank steak, and in my egg sandwiches. But today I wanted to make something different, using up some zucchini that I bought at the farmer’s market this weekend and I came up with this delicious frittata. 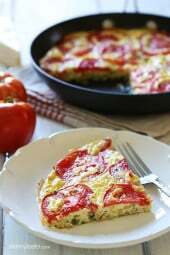 What I love about frittatas is that you can enjoy them for any meal and they are so inexpensive to make. Today’s leftovers from lunch are going to be tomorrow’s breakfast. Perfect for meatless mondays, gluten free, clean eating and low carb diets. Heat oil in a 10-inch skillet over medium-low heat. Stir in onion and cook until slightly golden, about 8 to 10 minutes. Add zucchini, increase heat to medium-high, season with salt and pepper and cook 2 to 3 minutes or until the moisture dries up, stirring occasionally. In a medium bowl whisk eggs, egg whites, Asiago, salt and pepper. Pour the eggs into the skillet making sure they cover all the vegetables. Arrange tomatoes in an overlapping pattern on top and season with salt and pepper. When the edges begin to set (about 2 minutes) move skillet to oven. Cook about 16 to 18 minutes, or until frittata is completely cooked. Serve warm, cut into 4 pieces. I added 1 cup of fresh baby spinach leaves to the recipe….very nice and easy recipe! Will definitely make it again. Great Brunch, paired it with fresh fruit and coffee!!! I am just trying everything in the meal plan and this breakfast did not look too exciting. But honestly, it was good and… very filling. I added 2 table spoons of chilli and tomato relish… delish! Loving your recipes. This was great! I spiralized the zucchini and then chopped it up. It was much quicker that way. I also don’t have an oven proof skillet so I transferred it into a glass baking dish sprayed with olive oil cooking spray and increased the cooking time in the oven to 25 – 30 mins (until it was set and no more liquid). Worked perfectly! This was great for a casual Sunday evening dinner; the whole family including grandkids gave it rave reviews. The flavors came together so well and it was really easy to put together. To round out the meal I served the frittata with fruit and grits as sides The only thing I changed was to cut the zucchini into ribbons with the Vegetti. Sounds delicious! 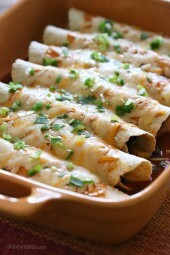 Has anyone made this recipe without any cheese? still good? or is there something else (perhaps extra seasoning?) that I could add instead? Hi Gina… this reminds me of the frittata that my grandmother use to make… Made this one last night and it was delcious. and easy to make… Love all your recipes.. Thank you for sharing them with us. Delicious! I added a little fresh cilantro to the egg mixture, yum, yum yum! I made this recipe and substituted 1/4 c part skim ricotta for the Asiago. It was completely delicious! This was my first Fritata and it was so easy to make, turned out beautiful, and was delicious. Made it for my Labor Day brunch and can’t wait to enjoy it for my breakfast the next 3 days. Your recipes are scrumptious and meal planning is a breeze. Have lost 70lbs since January and 30 more to go! Skinnytaste makes it easy! This tastes so good! The zucchini gives it a hardiness that I love. Gina, thank you so much for getting me out of a rut. I would never even consider making zucchini matchsticks if it were not for you! Hi Gina….I love your recipes and meal plans!! 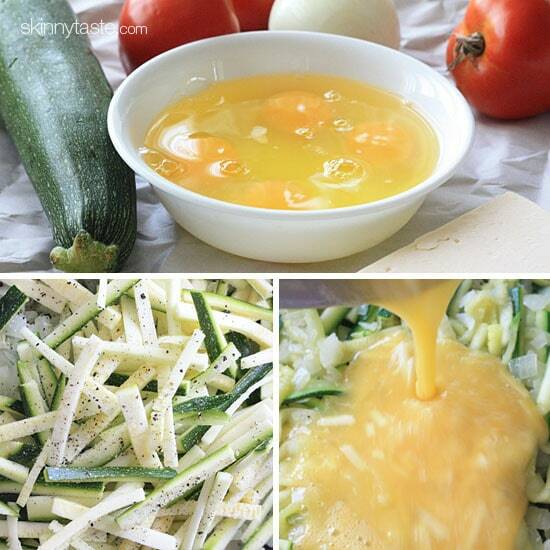 I’d like to make this frittata, and wondering if I could spiralize the zucchini and cut it into smaller pieces. I would be too impatient to cut it into matchsticks!! 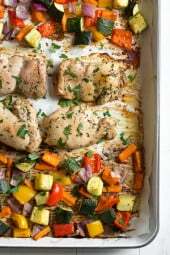 I would like to make this recipe but I don’t have a pan that can go in the oven. Any suggestions? Can I make this in a pie pan instead of a skillet? I have made this frittata several times and I love it. I live alone and I’m a senior and 1/4 of this with a small salad makes a wonderful lunch or dinner. It’s really tasty. We need to make this dairy – what could we use instead of cheese? Could we add some flax milk? Love this recipe! I have made a couple of times,, question I have a ton of yellow squash that someone gave me from their garden, do you think I could use that instead of zucchini? Just made this and it was delicious! I used Parmesan Romano cheese instead of Asiago and I baked in muffin tins for individual servings. 375 for about 12-14 minutes. I will freeze some for later. Another fabulous recipe Gina!!! Just made this for breakfast this morning. I didn’t have zucchinis (go figure!) so I substituted with yellow bell pepper. 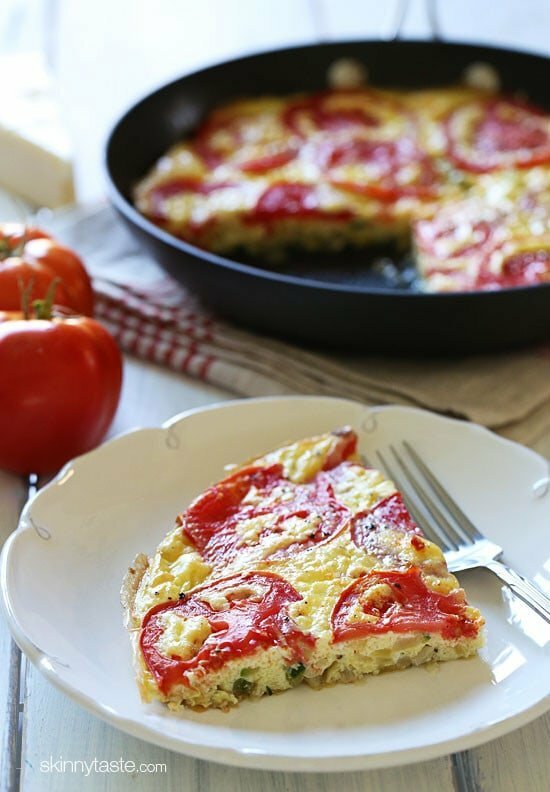 I highly recommend this frittata recipe! It was my first attempt at making one and it turned out perfectly! I used Sargento Light Italian four cheese blend and grated parmesan romano in place of the asiago. 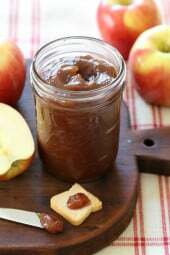 Skinnytaste.com is my first choice for great tasting light recipes! I made this for dinner tonight and it was delicious! I added a purple bell pepper and used parmesan because it was what I had on hand. Next time I think I'll add fresh basil too. Thank you for making my Weight Watcher' s journey so much fun! Can I shred the zucchini? I was wondering the same thing, why not shred, so much faster. Looks and sounds amazing! Can't wait to try it. Do you think this will freeze/thaw well? I don't know if my skillets are heat safe to 400 degrees in the oven. Can this be made in something other than a skillet when you get to the oven part? This is in the oven right now. It's going to be great! I always get the salt and pepper wrong in my eggs…but this seems to be a good way for me to get the taste right. I could also add some seasoning to the veggies to get some nice flavor to it. This was great! We didn't have asiago, so I substituted reduced-fat cheddar. Delicious and filling! Just made this and it was delicious!! You are my go-to food blog for everything! Thanks for yet another yummy, easy, and healthy recipe!! Yum! I just made this and it was delicious! My 2 year old son is usually picky about egg dishes and he gobbled it right down! I sprinkled some extra asiago cheese on top, too. Definitely going to make again! Made this last night for breakfast for the rest of this week…it turned out so beautiful, I almost ate some last night! 🙂 But resisted until this morning and it was DELICIOUS! Such great flavors. Thank you for all of your amazing recipes!!! Made this with feta cheese and put it directly in the oven for 30 min. It was perfect! Love your recipes, Gina! I need to buy a new skillet…. can you recommend a good one for going from stove top to oven, and also non-stick? Thanks! I don't have an oven proof pan, nor an oven big enough to fit a pan. So I did the whole thing on the stove as was described, then transferred the veggies from the pan, gave them a swirl in a preheated tart tray (so I didn't have to oil/butter the tray), added the egg/cheese mixture on top of that, topped it off with the tomato and stuck it in the oven a little bit longer than described (about 20-25 minutes). Worked great! Thanks for the recipe. Thanks! I will be trying that for breakfast. Would this still work if you put it directly in the oven vs on the stove top first? I haven't tested it, but I suppose it would if cooked longer. This is such a delicious, simple recipe! I made this with fresh vegetables from the farmers market and added some fresh basil on top and I really loved it. Your recipes are always great – thank you! I made this for dinner tonight with my bounty from the farmer's market. Delicious! Thank you for sharing your great ideas. I hate to waste food, so I was thinking about making this using four eggs and egg beaters for the whites. That would work, wouldn't it? I think egg beaters is just egg whites, right? I enjoy your recipes and can't wait till I have the money and ingredients to try them. They all sound and look delicious. Just wanted to tell you yet again how much I enjoy your many recipes. I'm a weight watcher member and it helps so much that you include the point value on every recipe. I wonder how feta cheese would pair with this? I might experiment! Made this last night and it was delicious — very flavorful! Also it scaled down easily. I only wanted enough for one dinner and one lunch! I substituted Parm for the asiago. Can you say how much I would need if I were using Egg Beaters instead of the traditional eggs/egg whites? I think it tells you the equivalent on the package, use the equivalent to 6 eggs. I have the same question as NanaJo…. 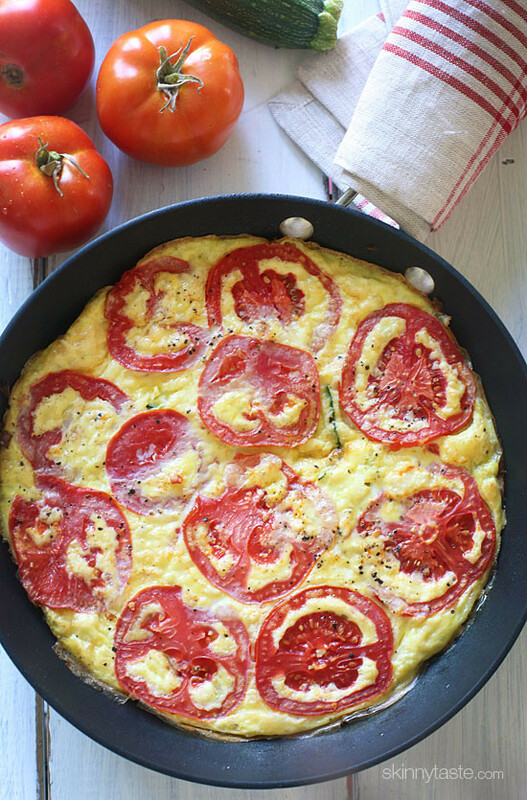 Frittata's really are perfect for anytime. One of the most perfect foods! Plus, they are pretty easy and can utilize leftovers just like you said. Bonus points. How do you cut the zucchini in the matchsticks? I slice them into 1/4 inch thick slices. Then I take those slices and cut them across into 1/4-inch wide pieces. Just curious why the recipe calls for 4 whole eggs and 4 egg whites? I like to cut back the egg yolks to lighten it, and this is the perfect ratio. If you don't care about the extra calories, just use whole eggs. So if we do not use the egg whites would we do 8 whole eggs or still just four? Holy cow! Were you reading my mind with this one? I was just telling a coworker that I need a dinner idea that uses zucchini, tomatoes, and eggs since my fridge is overflowing with all of the above. You're awesome! Perfect timing! I have three square planter boxes and we planted four tomatoes in each and we are now over run with tomatoes! Next year, we'll plant less for sure. As long as it's oven safe, you're good. Wow. This looks like it'll be dinner tonight! I don't have any asiago on hand, but I do have cheddar and goat cheeses. Either one of those sound better than the other in this recipe? Use cheddar or even parmesan. I used parmesean and it was yummy. I also added a bit of minced garlic to the zuchini and onion. I may not be a huge tomato fan, but this looks like it may convert me. Yum! One great recipe after another….not an egg fan but would definitely try this one. Thanks Deedee, it was good! What could replace it if I am allergic to zucchini? Mushrooms would be great, or red bell peppers.